The story of Germans contributing directly to New Orleans’s very existence began when Karl (Charles) Friedrich (Frederick) D’Arensbourg, an ethnic German who would today be considered a Swede (he originally came from the German section of Stockholm), took over the stewardship of a group of impoverished but hearty Southern German settlers. Having come to Louisiana under the flag of John Law’s Company of the Indies, the few Germans who survived the disease-ridden passage from Europe languished on the beaches of Biloxi and Dauphine Island, victims of Law’s dilettantish colonization plan. Upon arrival, the colonists, who came as engagés of the Company, were provided with nearly no means of support and little plan to follow. According to some historians, they were sent to settle Law’s concession in an untamed and difficult region of present-day southern Arkansas. They were unsuccessful, however, and many perished in the attempt. Out of frustration, the surviving settlers abandoned the colony and headed to New Orleans, intending to demand passage back to Europe. Once they arrived in the city, however, they were persuaded to follow D’Arensbourg, who had won favor with the French governor, Bienville, and to settle what was considered to be the best land in the colony, about 25 miles upriver from New Orleans. Other historians argue that the group that struggled and failed in Arkansas was an unrelated one, and the story of the German Coast begins just there, when D’Arensbourg and his settlers arrived from beleaguered Biloxi in what is today St. Charles and St. John the Baptist Parishes. Under D’Arensbourg’s leadership, this community of farmers quickly began to provide life-saving sustenance to the ragged collection of soldiers and provincial bureaucrats occupying the haphazard encampment of buildings called New Orleans. The Germans established their colony on the Mississippi in 1721 and, as engagés, had a commission to sell their surplus harvest to the company for the purpose of supplying New Orleans. As early as 1724, the French Superior Council recognized the importance of these goods by issuing a decree guaranteeing their protection en route to New Orleans from the settlement. When John Law’s bankruptcy caused the company to disintegrate in 1731, the settlers ceased to be indentured to anyone but continued to supply New Orleans. As census records and scholarly works found in THNOC’s German Study File illustrate, the contributions made by this community to the health and growth of New Orleans increased consistently through the eighteenth century. In fact, the Germans were not only supplying the provincial capital with staples, but were also sending timber and rice to Cap Français, the wealthy capital of the flourishing St. Domingue colony, and to France itself. In 1803, Napoleon’s prefect to Louisiana, Pierre Clément de Laussat, even recommended introducing a regular flow of German settlers to the region, as they were the only group who had as yet proven itself capable of taming the Louisiana wilderness. Indeed, as evidenced in a number of the manuscripts records below, the German population up-river from New Orleans thrived through the eighteenth century. It wasn’t until close to the middle part of the nineteenth century, however, that Germans began to constitute a significant portion of the population of the city of New Orleans. John the Baptist Parish Records, 1813–1829. MSS 22. 7 Items. The collection consists of the general census for St. John the Baptist Parish and the German Cost for the year 1813, of Levee Inspection Reports for 1814 and 1815 in St. John the Baptist Parish, and of the Tax Assessment Roll for that Parish in 1829. Listed are the names, professions, kinds, and value of lands owned by the inhabitants. Occasionally included are the slaves, livestock and taxes due by residents. Also found in this collection are a register of intended marriages and the general rules of the Police Jury of St. John the Baptist Parish. Spanish Colonial Land Grant Papers, 1767–1834. MSS 79. 21 items. The collection consists of petitions for land grants, conferred grants, and acts of sale with certification of copies, as well as a passport issue and a request by de Bastrop for an exchange of property. Land grant records concern the Attakapas, Baton Rouge, Bayou Plaquemine, Lafourche, Natchez, Natchitoches, Opelousas, Orleans, and Quachita areas. Of special interest is an inventory of structures on the German Coast. The collection contains information about Indians, free persons of color, slaves, and women. Among the prominent persons represented are Joseph Chretien, father of planter Hypolite Chretien (1781–1839) who built Chretien Point plantation near Opelousas, and land developer Philip Hendrick Nering Bogel, alias Baron de Bastrop (1759–1827). Surveyors include Carlos Trudeau and Alexandre Francois Joseph DeClouet de Piedra (1717–1789), the commandant and judge of the Attakapas and Opelousas posts. Reports on the Cession of Louisiana to Spain by France, 1762. MSS 178. 2 items. The first of the two items in this collection is a 34 folio report written by Julien de Arriaga in 1762. Divided into four chapters, it deals with the history of the discovery of the region, a review of French activity in the region, the Spanish political organization of the Gulf of Mexico area in contrast to the French. The last section concerns the governance of Florida and boundaries. The second item is a 34 folio report on the actual state of affairs of Louisiana by Santiago Disdier. It relates the strategic importance of the Mississippi River, the City of New Orleans, "English Turn," commerce, the German population, Pointe Coupee, the Post of Natchez, Arkansas and the Presidio of Natchitoches. The inhabitants of these regions are discussed. J. Hanno Deiler Papers, 1849–1909. MSS 395. 118 items. These papers are the basis for the work of John Hanno Deiler. They contain genealogies of prominent Louisiana German families, as well as draft and final versions of Deiler's writings concerning Germans in the Southeastern United States. Barthélémy Lafon Survey Books. MSS 408. 2 Volumes. This collection consists of volumes I and II of surveys by B. Lafon. The books contain ink and watercolor plans and surveys. Areas include the French Quarter, Faubourgs St. Mary and Marigny, St. Charles, St. John, and St. James Parishes, Bayou St. John, Lake Pontchartrain, the German Coast, Donaldsonville, and Grand Isle. Includes building placements, narratives, and name index. Centre des Archives d'Outre-Mer, "G" Series - Louisiana, Microfilm. 2002-68-L. 4 reels. The "G" Series is primarily composed of diverse documents originally in the Fonds Naval Ancien, or Maritime archives. The microfilmed documents relating to Louisiana range in date from 1717 to 1789. Topics covered are appointments, commerce, the Company of the Indies, passenger lists, passenger lists for Germans traveling to Louisiana, marriage registers, census records, burial registers, reports on the activities of various people in Louisiana, land grants, ship wrecks, and requests to relocate to Louisiana. 4 reels of original microfilm material. Children's Carnival Float with the title “Coming of the Germans, 1721.” Charles L. Franck Photographers (photographer). Children from St. Cecelia's School with their Mardi Gras float, shown near Thalia Street. 1920s. Acc. No. 1979.89.7353. 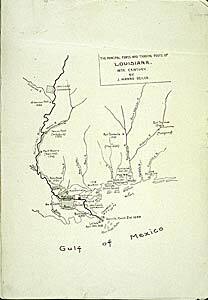 A New Map of the River Mississipi [sic] from the Sea to Bayagoulas. Engraved printed map with watercolor. Kitchin, Thomas (Engraver). Jefferys, Thomas (Cartographer). London Magazine (Publisher). Map extending from the Chandeleur Islands to west of Lake Maurepas and from the mouth of the Mississippi to Lake Pontchartrain. The location of Indian tribes is included, as well as the German Coast, towns, bayous, New Orleans, topography, marsh, mouths of the river, depths, and shallow water in the Gulf of Mexico. It was originally included in London Magazine. Acc. No. 1993.2.19; 1993.2.20. Deiler, J. Hanno. “Die ersten Deutschen am unteren Mississippi und die Creolen deutscher abstammung: Vortrag, gehalten am 16. September 1904 vor dem ‘Germanistischen Congress’ in der Congresshalle der St. Louiser Weltausstellung / von J. Hanno Deiler.” New Orleans, La. : Im selbstverlage des verfassers, 1904. 24 cm. Conrad, Glenn R. The German Coast: abstracts of the civil records of St. Charles and St. John the Baptist parishes, 1804–1812. Glenn R. Conrad. Lafayette, La. : Center for Louisiana Studies, University of Southwestern Louisiana. c1981. Giraud, Marcel. A History of French Louisiana, volume 5, The Company of the Indies. Brian Pearce, trans. Baton Rouge: Louisiana State University Press, 1991.